Ever Wonder What Happened To Jar Jar Binks After Revenge Of The Sith? Warning – Possible Book Spoilers ahead! 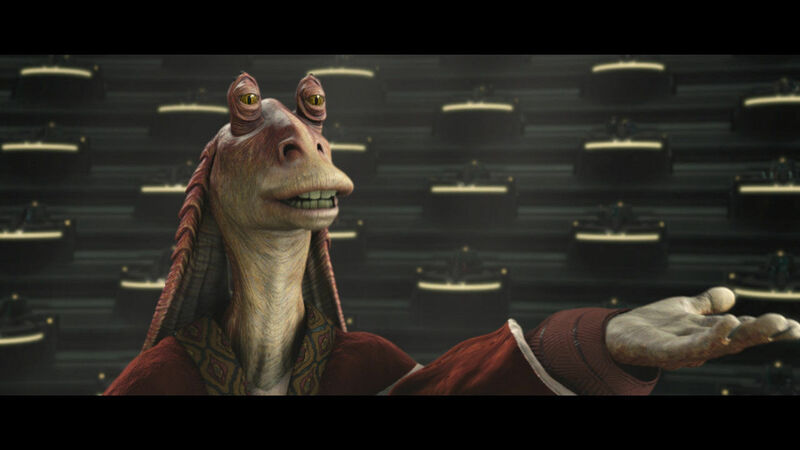 There is probably no more polarizing figure in the Star Wars universe than Jar Jar Binks. While some young children found the clumsy Gungan entertaining, most audiences found him to be annoying, distracting and even a little offensive. Personally, I found Jar Jar Binks a little too cartoon-ish for the Star Wars universe. Jar Jar Binks was last seen at Padme’s funeral at the end of “Star Wars: Revenge of the Sith” and no mention was made of him since in the new post-Disney-purchase Star Wars canon. Whether you love or hate the character (did I mention I hate him), he does play an important role in the Star Wars continuity. Remember, in “Attack of the Clones”, he is the one that went before the galactic senate to propose the war powers act which essentially gave Palpatine his powers. Thus, Order 66, the extermination of the Jedi and all the dark times that followed could, at least partially, be traced back to him. This does not go unnoticed by those around him or by himself. I think this sad ending for this character is actually a good idea. It brings a level of realism to this character I previously described as too cartoon-ish. I think Disney is smart enough to not bring Jar Jar Binks back into any new movies for risk of negative feedback, but they don’t want to out right kill off the character either. He was well liked by a small fan base and could still be a licensed merchandise revenue source for Disney. Star Wars Aftermath: Empire’s End has a release date of February 21st and the entire trilogy is available on Amazon.